Running roughly for a kilometre, Church Street is a busy thoroughfare in the heart of Bengaluru’s business district. But for bibliophiles, from the city and beyond, it is a pilgrimage trail—one that involves stopping by half a dozen bookstores and ends with a cup of coffee at the legendary Koshy’s café on nearby St Mark’s Road. Church Street may not have the upmarket elegance of Mumbai’s Kala Ghoda, the hipster swag of Delhi’s Hauz Khas Village, or the old-world dreaminess of Kolkata’s Park Street, but it has books. Tourists and visitors to the city seek it out the way they do Mumbai’s Flora Fountain, Kolkata’s College Street, or Delhi’s Daryaganj. But this Bengaluru book trail remains unique for its proper brick-and-mortar stores, rather than makeshift roadside stalls. 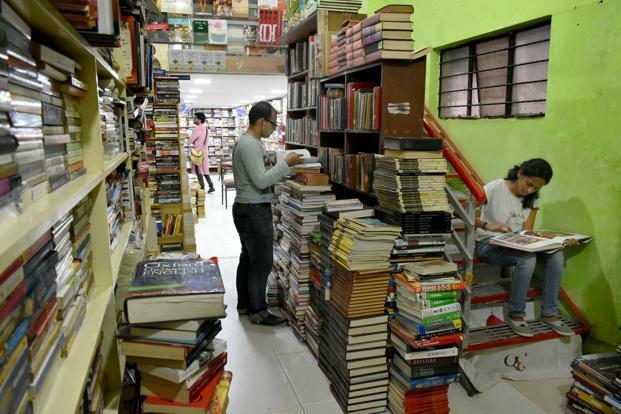 On any day of the week, these shops are buzzing with buyers and sellers of used books—a heartening sight at a time when the death knell for physical stores is being sounded all over the world. Call it an oasis for bibliophiles if you will, but the Church Street book stores are also up against an unromantic reality: behemoths like Amazon and chain book stores offering jaw-dropping discounts and delivery services. In spite of the competition from external forces and each other, these book stores retain a starkly traditional character. Be it Bookworm, the two Blossom Book Houses, Gangaram’s Book Bureau, Goobe’s Book Republic, or Bookhive (the newest entrant to Church Street), these shops are filled with books—from wall to wall, floor to ceiling, used, new, first editions, antiquated, or procured on request. Not for them the frill of merchandise or counters dedicated to selling e-readers. A survey conducted by Amazon India for the year 2017 placed Bengaluru ahead of Mumbai and Delhi as India’s most well-read city. Although the report was based on online sales trends, Bengaluru’s eminence in the list is convincing. Chain retailers in the city like Sapna Book House and Higginbothams (a refurbished outlet opened last year on MG Road, a stone’s throw from Church Street) mostly cater to a mixed market for popular titles, utilitarian textbooks, stationary and e-readers. The Church Street booksellers, in contrast, provide unadulterated indulgence: literary fiction and non-fiction, across a range of subjects, spanning decades. Apart from the front-list of major publishers, these include titles passed through many hands, their pages musty with age, scribbled over with marginalia, with forgotten flowers, the odd love letter or a crumpled laundry bill keeping time. It’s an alternate universe for seasoned booklovers. Krishna Gowda, who owns Bookworm, says he was always obsessed with books. “In 1997, I started selling on the pavement on MG Road,” says the man who comes from a small village near Mysuru. “In 2000, I opened a shop there, before we moved to Church Street in 2007.” About 75% of Bookworm’s stock is used books, he adds, with history, literature and biography forming the store’s backbone. Like all the shops in the locality, Bookworm offers 15-20% discount on new titles, and 50% “store credit” for returning old books. Another place I need to go..